DrRajHealth: Were you shocked to know your cancer is not curable? Were you shocked to know your cancer is not curable? 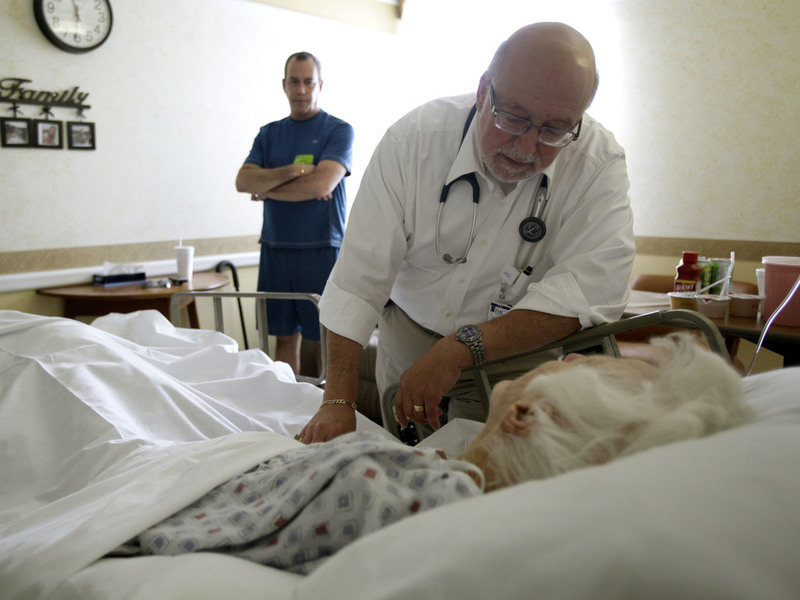 Dr. Joel Policzer checks on his patient, Lillian Landry, in the hospice wing of an Florida hospital in 2009. A new study found that many terminally ill cancer patients don't fully understand their prognosis. Doctors are often called upon to deliver bad news to patients, and there isn't much that's worse than a diagnosis of an advanced-stage cancer for which there is no cure. But there's new evidence that a surprisingly large majority of patients who receive this news don't fully comprehend it, or perhaps willfully choose to ignore it. Almost three out of every four patients diagnosed with stage IV lung or colon cancer believe that chemotherapy can cure them of their disease, according to a survey of more than 1,100 cancer patients by the Dana-Farber Cancer Institute. And yet for cancers diagnosed at that late of a stage, chemotherapy has been definitively shown to extend lifespan by only a few months at best. Deborah Schrag, a physician at Dana-Farber who helped conduct the study, says patients who don't understand the severity of their diagnosis can't make plans for their final few months or years. "If you think chemo is going to cure you," she says, "maybe you don't have that conversation about a trip to California. Maybe you spend your time getting chemo and you don't spend time on your boat. We know that when people have unrealistic expectations they're much less open to discussing end-of-life planning." The survey, which appears this week in the New England Journal of Medicine, also found that patients who rated their doctor as being a good communicator were more likely to hold mistaken beliefs about their prognosis. Schrag says this indicates that some doctors may be trying to tell their patients what they think they want to hear, rather than the truth. "It's not that [doctors] don't disclose that chemotherapy won't cure the cancer. It's that we disclose quickly and then move on," she says. "But patients always want positive news. In the short term, people will be happier if you give them happier news." Sandra Swain, an oncologist at the Washington Hospital Center and president of the American Society of Clinical Oncology, says it's ultimately the doctor's responsibility to ensure that their patient fully understands what's happening to them. "There needs to be continued communication about the prognosis and it needs to be done early on," she says. "I don't think physicians do it particularly well. ... Many physicians just have a very hard time communicating that they're not going to be able to cure the patient." Swain says the results of the Dana-Farber survey are a sign that doctors need do a better job of helping terminally ill cancer patients let go of false hopes without squashing all hope. "You don't want to take away hope from patients," says Swain. "They're not going to be cured but it's not like they're going to die instantly. So it is a really hard balance to achieve." And comprehensive palliative care still be hard to find: only 59 percent of hospitals with more than 50 beds offer it, as Michelle Andrews reported last year.